The festive season gives the traveller an excellent opportunity to sample the many scrumptious Christmas cakes and treats that are made this time of year and at no other time are there more delicious local delicacies on offer than over the Christmas holidays. 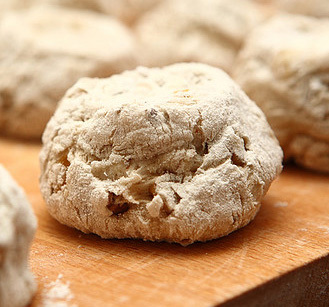 Italy is not different in this regard and tourists around the country can discover the many regional variations in cuisine during the festive season. Italy has an excellent collection of tasty morsels that come onto the shelves of local shops around Christmas and many have interesting stories behind their origins. Panforte is another Tuscan cake made with almonds, spices, honey and candied fruit. There are two stories about its discovery; the first tells of an orphan who visited the baby Jesus, having nothing to offer the infant, save a dried crust of bread from his pocket. Joseph gave a crumb to one of the birds nesting in the roof and returned the rest to the boy, thanking him. The orphan left feeling upset that his gift was too poor an offering but on his return home he found his mother dressed in elegant clothes and his father in a bright shiny suit of armour. On the kitchen table was a feast, the centrepiece being a cake made with almonds, honey and spices. The second story from the 13th century is that a nun called Sister Leta found that rodents had eaten through the bags containing the sugar, spice and almonds. The ingredients had become all mix up together in the cupboard, moving a black cat out of the way she suddenly thought “why not just mix them all together in a pan.” Not wishing to waste the scarce ingredients she decided to bake a cake with the mixture. Once it was ready the cat purring, turned to her and said, “Go on then, try it”. Sister Leta realising that cats cannot talk, therefore it must surely be the devil in disguise and threw the contents from the pan over the cat and promptly banishing the demon back to hell. Upon hearing the racket Sister Berta, the Mother Superior came running into the kitchen and listened to the tale, curious as to what wondrous baking could defeat the Devil and so panforte came to be made. 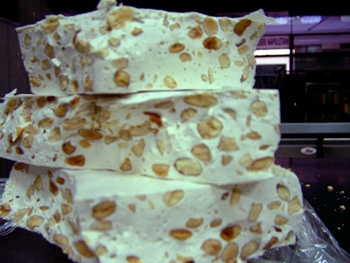 In Northern Italy, a Christmas cake, containing honey, almonds, eggs that has an interesting story is the Torrone. It was first created on October 25th, 1441 for the wedding of Bianca Maria Visconti and Francesco Sfroza in Cremona, Lombardia. It was made by the city’s pastry chefs for the wedding in the shape of the city’s famous tower, the “Torione,” which at that time dominated Cremona’s skyline. As the Viscounti was well known throughout Europe, guests were invited from far and wide. After the happy occasion many of them took home the recipe for this delicious sweet cake and it rapidly became a popular cake all over the continent. This Milanese cake is famous the length and breadth of Italy during the festive season and was first made, legend has it, in the 15th century. A nobleman and falconer Ughetto Atellani who fell in head over heels in love with the daughter of a poor baker called Toni. The lord, disguising himself as a baker, made a rich, sweet cake containing nuts, candied peel, and raisins in order to win her hand. The Duke of Milan, Ludovico il Moro Sforza agreed to the union and at the wedding, which the artist, Leonardo da Vinci was present, the cake Panettoni (Toni’s bread) was served. Pandoro or Golden Bread has a long history, its existence documented as far back as the first century, where documentary evidence indicates that the Roman Scholar, Pliny the Elder had a liking for it. The cake became very popular with rich aristocrats during the Middle Ages and due to the expensive ingredients of spices, nuts and honey or sugar was mainly served in palaces across the land. The modern version is credited with being perfected in Verona where it was near the spice markets of Venice. This entry was posted in Travel and tagged cake, cavallucci, Christmas cake, Christmas holidays, Italian food, Italy, pandoro, panettoni, pantone, torrone, travel, travel content, vacation. Bookmark the permalink. I really enjoyed reading about the various Italian Christmas cakes. Your photos make me want to eat one along with a cappuccino. I especially enjoyed learning about the Panettone and hearing about the origin of the name/word. The panettones are popular in the United States but I bet they taste much better in Italia. Ciao! Thanks Lisa, I got hungry just writing it. You can’t beat a slice of panettone, and a cappucco sat on the sidewalk in the sun. Roll on the spring.